I am proud to say that I am *almost* done reading The Girl Who Played With Fire, which is the second installment in the Millennium series by Stieg Larsson. I am hoping to finish it tonight, and then I can move on to the third, and final, book, The Girl Who Kicked The Hornet’s Nest. In other news, I went back to the gym last night! It was my first time going in about two months. I did 36 minutes on the elliptical, 13 minutes walking on the treadmill, and 20 minutes of weight-lifting machines. Let’s just say, I was a hot’n’sweaty mess. I also plan to go back tonight – let’s hope this lasts! 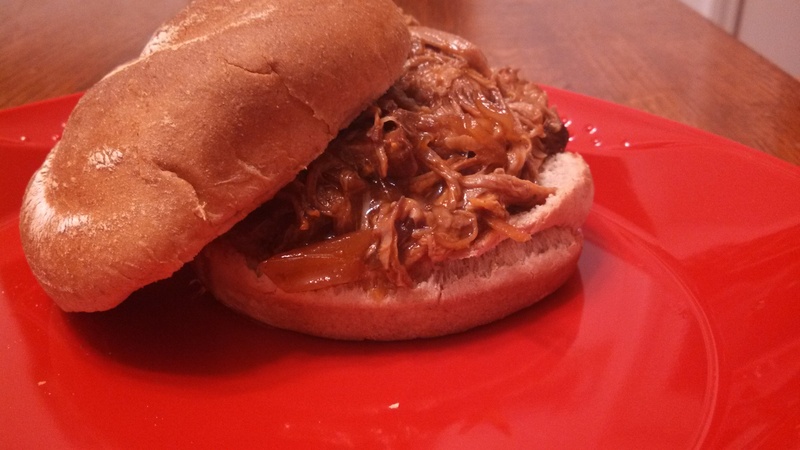 Two weeks ago I made this yummy pulled pork recipe from Eat at Home’s blog. My husband said it was the best pulled pork he’s had. It was all kinds of delicious. I used whole wheat buns and served them with a side of corn and French fries. I liked that we had almost all of the ingredients at home (including liquid smoke – we have two bottles, one mesquite and one hickory, from a few previous recipes), except the pork and taco sauce (which was strange, since we typically do have that laying around). I changed the “directions” section a little, because the original blogger’s method didn’t really make sense, also a little unnecessary, but you can click her blog link and decide for yourself. It was so tasty, and not dry or flavour-less at all! Besides, who doesn’t love a good pulled pork recipe?? Serves a lot of people! -Trim the fat off your pork shoulder and place in the slow cooker. -Add all of the other ingredients on top and mix around a little. -Cover and cook on low for 8ish hours (I stirred mine a little more closer to the 8-hr mark, and took the bone out, then let it cook for just a tiny bit longer). okay, i’m gonna make this for wednesday when anita comes over for dinner.